"Guilty of Love" / "Gambler"
"Give Me More Time" / "Need Your Love So Bad"
"Standing in the Shadow" / "All or Nothing (American Mix)"
"Love Ain't No Stranger" / "Guilty of Love"
Slide It In is the sixth studio album by British hard rock band Whitesnake, released in 1984. It was the first Whitesnake album to be released by Geffen Records in the US, but was remixed for the release there. Because of this, two different editions of the album exist, each with its own unique qualities. It was their fourth top 10 album in the UK, peaking at number 9. In 1988 the album re-entered the US charts due to the success of the self-titled Whitesnake album (1987), and is certified double platinum. 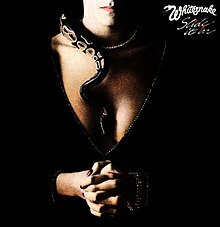 It was the final Whitesnake recording to use the band's original "snake" logo. The album eventually sold over four million records. "(…) I realised that as soon as we started rehearsing and playing that it wasn't the same band, it never felt right. Mel Galley is very talented, a good singer, a great guitar player, but that band just didn't work out. Cozy [Powell] was a great drummer, I always had a lot of respect for him, but he just didn't have any feel for the old Whitesnake sound. Cozy Powell brought with him a bass player called Colin Hodgkinson. Me and David knew Colin in the North East back in the sixties. He was a great legendary bass player, worked with the jazz/blues styles, but he never struck me as the bass player for Whitesnake. It was more the heavy metal attitude, probably because of Cozy's influence. He was a more heavy drummer than Ian Paice. There were flames and explosions going on, not really my cup of tea. It seems to me now that maybe Cozy wanted the band to be much more heavier and flasher." Moody completed the recording of the whole album with new producer Martin Birch, who had replaced Kramer after his dismissal for lack of feeling with the band. He also co-wrote the song "Slow an' Easy", but things came to a head in late 1983. According to Moody, Coverdale's personality had changed compared to when they got to know each other in 1976. "Me and David weren't friends and co-writers anymore. David never said anything to me. He just didn't socialise with me anymore. David was a guy who five, six years earlier was my best friend." Moody finally decided to leave Whitesnake when Coverdale embarrassed him in front of Thin Lizzy guitarist John Sykes, who were touring alongside Whitesnake. "Then one night we were in Germany and we did kind of a mini festival with Thin Lizzy and John Sykes was on guitar. Back at the hotel we were all sitting around and David was really talking a lot to John Sykes. I was sitting there quietly and David just turned around to me, pointing his fingers and said, 'Don't you ever turn your back on the audience again'. I went, 'Pardon?' He said, 'That's really unprofessional', in front of John Sykes to make me look small and I thought to myself, 'That's it'. I nearly said to him, 'Get him in the band', cause even I knew by then he wanted somebody like John Sykes, cause he looked good and he was a good guitar player. I decided to leave after finishing the end of the tour. The last gig was in Brussels in Belgium in October 83." Apparently, this did not seem to be a major problem to Coverdale, as, according to Moody, "After the gig, I said to the tour manager, 'I want to have a meeting in my room with all the band: I have something to say'. The other band members arrived and I said, 'Where is David?'. The tour manager came and told me, 'David is entertaining people in his suite, and he won't come down.'" Soon after Moody's departure, John Sykes was announced to the press as the new Whitesnake guitarist. At the same time it was in the news that Hodgkinson had been fired, as Coverdale felt that his style did not suit Whitesnake's new sound. As a result of Hodgkinson's departure, Neil Murray was asked to rejoin Whitesnake. When the UK release of Slide It In came out, it was a chart success, but was heavily criticized for the "double-entendre drenched lyrics and titles for which Whitesnake were already infamous" and for the album mix, which was deemed "resoundingly flat". This was soon to change, as Whitesnake's US label, Geffen Records, insisted the album be remixed. With the help of famous producer Keith Olsen, Slide It In had its sound revamped, having a bigger and at the time a more modern sound, as well as giving John Sykes and Neil Murray the opportunity to replace Moody's guitar parts and Hodgkinson's bass parts, respectively. Whitesnake engaged in a European tour with the Coverdale / Sykes / Galley / Murray / Lord / Powell line-up, but the band ran into trouble when Mel Galley got involved in an accident which damaged some nerves in his arm, making him unable to play the guitar. He continued as a Whitesnake member for a time, but was fired not long after. The five-piece continued touring until April 1984, until another line-up change followed. In April 1984 the Deep Purple reunion was imminent, and Jon Lord played his last Whitesnake concert on 16 April at Grand Hotel in Stockholm, Sweden which was filmed for the "Måndagsbörsen" Swedish TV show. Lord's departure now left Whitesnake as a four-piece, not counting the off-stage keyboard player Richard Bailey, who was brought into the band. The US edition of Slide It In rapidly gained airplay in the United States, suddenly increasing the demand for Whitesnake. The more streamlined, four-piece version of the band started touring the United States supporting Quiet Riot and then Dio. The extensive touring, along with the MTV-ready promotional videos for the songs "Slow an' Easy" and "Love Ain't No Stranger", helped the American market to open itself for Whitesnake, something which would lead to the band breaking big on the United States with their 1987 album three years later. The European edition of the album contains the original mix. This mix features a stronger presence of keyboards by Jon Lord, and the bass is more noticeable. The track order is also different from the US mix. The US mix lowers the keyboards and bass in the mix, and is more orientated around the guitars and drums. The US version features some different guitar solos to the European edition, with the addition of John Sykes as a third guitarist layered on top of the original guitar parts recorded by Mel Galley and Micky Moody. The bass guitar parts which were originally recorded by Colin Hodgkinson were replaced by returning member Neil Murray's bass guitar parts. The US version also included some new keyboard parts by Bill Cuomo. There are also other, more subtle differences in the mix. For instance, on the track "Gambler" on the UK version, Coverdale's voice echoes after every line he sings – this does not happen in the US mix. On the track "Slow an' Easy", the US version has more echo. In 2009, the album was re-issued as a 2-disc digipack to commemorate its 25th anniversary. On the first disc, the CD contains the entire US mix of the album and 8 of the original UK mixes digitally remastered, although the 1987 remixed version of "Need Your Love So Bad" is used on this release instead of the original version. The UK mixes of "Hungry for Love" or "Love Ain't No Stranger" are not included, but the acoustic version of "Love Ain't No Stranger" is featured (taken from Starkers in Tokyo). A DVD containing promo videos and live performances is also included. Notable is that the two songs on the "Guilty of Love" single ("Guilty of Love" and the B-side "Gambler") are the only released material from the first sessions with producer Eddie Kramer. The same songs will also be included as bonus tracks on the 2-cd version of the 2019 remaster. ^ Rivadavia, Eduardo. "Whitesnake - Slide It In review". AllMusic. All Media Network. Retrieved 8 May 2015. ^ Popoff, Martin (1 November 2005). The Collector's Guide to Heavy Metal: Volume 2: The Eighties. Burlington, Ontario, Canada: Collector's Guide Publishing. pp. 411–412. ISBN 978-1-894959-31-5. ^ g, manos (27 December 2014). "Review: CD Whitesnake - Whitesnake Album". Sputnikmusic. Retrieved 1 January 2015. ^ a b c d e f "Whitesnake - Official Charts". Official Charts Company. Retrieved 25 April 2015. ^ a b "RIAA Searchable Database: search for Whitesnake". Recording Industry Association of America. Retrieved 8 May 2015. ^ "The Growing Pains Of Whitesnake's David Coverdale". Loudersound.com. Future plc. 25 March 2011. ^ a b c Myhre, Stig (1997). "Whitesnake: The Last Hurrah". Hard Roxx (34). Retrieved 5 May 2015. ^ "Whitesnake – Slide It In (album)". Norwegiancharts.com. Media Control Charts. Retrieved 9 May 2015. ^ "Whitesnake – Slide It In (album)". Swedishcharts.com. Media Control Charts. Retrieved 9 May 2015. ^ "Whitesnake – Slide It In". Hitparade.ch (in German). Media Control Charts. Retrieved 9 May 2015. ^ "Album - Whitesnake, Slide It In". Charts.de (in German). Media Control Charts. Retrieved 9 May 2015. ^ "Slide It In Billboard Albums". Billboard. Retrieved 10 May 2015. ^ "Whitesnake – Slide It In (album)". Charts.org.nz. Media Control Charts. Retrieved 9 May 2015. ^ "Slide It In Billboard Singles". AllMusic. All Media Network. Retrieved 10 May 2015. This page was last edited on 5 April 2019, at 13:57 (UTC).